Additional smaller maps are also included. Offers superb detail of the American railway network. This atlas was issued by the Poole Brothers around 1900 and contains a prospectus of work to enable sale. Overall a comprehensive look at the railroads in America. Poole Brothers (fl. c. 1880 - 1968) were a Chicago based firm active in the early late 18th and early 19th century with an initial focus on promotional railroad maps. Poole Brothers was founded by George Amos Poole, one of the original four partners in the firm that would become Rand McNally, and his brother William H. Poole. 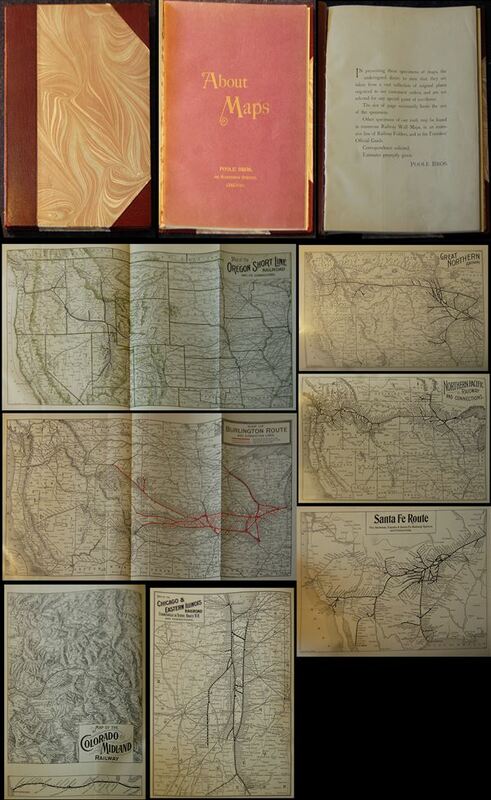 Poole started his own firm, Poole Brothers, as a direct competitor to Rand McNally for the lucrative railroad business. Like many of its competitors, Poole Brothers maintained an office on Chicago's Printer's Row (downtown Loop district). Nevertheless, the two firms, along with Cram and Company, seem to have come to an accord, at least with regard to price-fixing, for which they were cited by the Federal Trade Commission in 1948. Their earliest known work is an 1880 map of Yellowstone National Park. Afterward they went on to produce a vast range of maps and other print products including tickets, cards, coupons, and restaurant menus. In time Poole Brothers merged with Newman-Randolph, which was then acquired by the American Can Company in the early 1960s. The American Can Company liquidated its printing concerns later in the same decade. Very good. Contains over 30 maps.